The plan to eat all the sandwiches on the Smith & Deli menu as a Vegan MoFo challenge started as a jokey exchange on a Facebook group I am part of, but after a moment’s thought it seemed like a great idea. Since I started the research (as in – eating) for these posts, Vegan Mofo has changed the rules. Instead of a single theme for the month of your choice, they decided to have one common theme each day. I’m rebelling and I have decided that all the posts will be on my chosen theme, just like before. These posts happen to fit nicely into the Vegan Mofo 15 theme #5 of Best Sandwich Ever. I had a choice of publishing them over the month, or all on day five. I decided to string them out. Bad me. Smith & Deli opened in mid June with, amongst other things, a spectacular 32 item vegan sandwich menu. 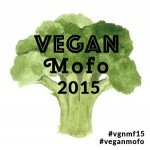 I was on a mission to try them all, so why not write them up for Vegan Mofo 2015? I was going to attempt to eat them all in the 30 days of MOFO, but in the interest of full disclosure, and the protection of my waistline, a number of these sandwiches were consumed in June, July and August. The Home Alone sandwich had me written all over it, so it was always going to be my first choice on opening day. It consists of a roll with turkey, stuffing, cranberry sauce, roasted brussels sprouts, mashed potato and gravy. The sandwich I actually ate on the frenzy of opening day was a one off special as they had run out of both rolls and turkey. 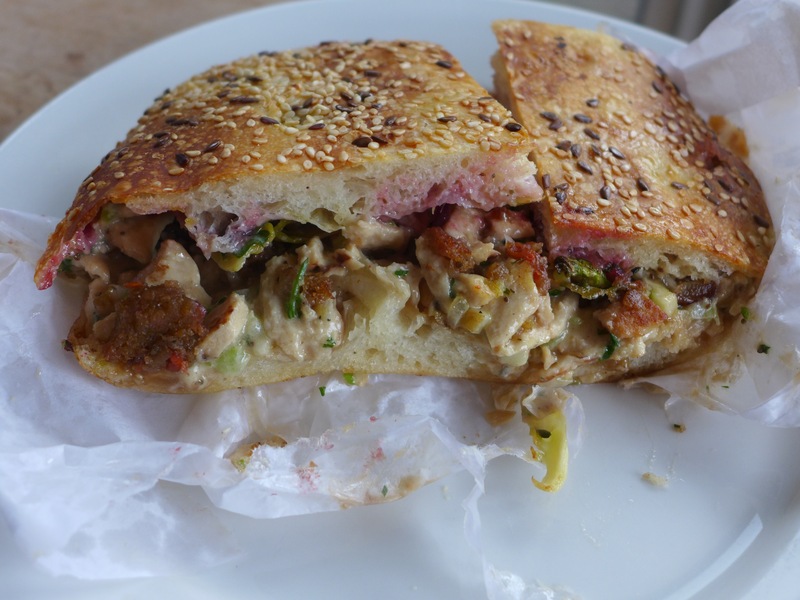 Mine was in sublime turkish bread from Noisette Bakery and the turkey was replaced by chicken salad. Both were really excellent substitutions. This sandwich was so delicious it actually made me a bit weepy. Beware! This is how the slippery slope of sandwich addiction begins! Best theme so far! Damn jealous of you Melbourneites. Yes we are so lucky! I am so looking forward to your theme! I am going to Melbourne in October and I can’t wait to try sandwiches. I want to eat all the sandwiches! But especially this one. Do you think the sandwiches keep fairly well if you bought some and stashed them in a fridge for future snacking? Some of them would I think. I reckon everything tastes better toasted. I toasted one later in the day because I was so full after eating a pie. Looking forward to any of your recipes! (Would love those sammies) But I’m loyal, Angel – with or without those delicious sounding sandwiches! So glad you went with this theme 😉 Can’t believe I haven’t been to Smith & Deli in what feels like forever! yeah i had plans for vegan mofo too and then they changed it all argh! Sandwich looks fab, what is the turkey made out of, seitan or tofu? Cate, the turkey is seitan. I just rebelled on Mofo, quite a few people complained and now they are saying the daily themes are just guidelines and you can still do your own thing. I wish I’d known that they relaxed the themes too – it put me off signing up this year. I’m glad you’re forging ahead with this one, Rosalie!